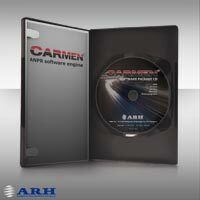 CARMEN Parking is a special version of CARMEN Automatic Number Plate Recognition technology. It has been developed to offer an excellent solution for the growing need of Parking and Access Control management systems. Nowadays, parking lots are becoming an organic part of our everyday life. CARMEN Parking offers flexible, low maintenance, yet effective and intelligent technology for car park operation. It reduces costs as well as increasing efficiency and security. CARMEN Parking is a core technology rather than a complete application, as it was specially designed and developed to be easily integrated into complex parking and access control applications. As a flexible system it can be tailored to meet special customer requirements. - To achieve the best image and avoid any incompatibility difficulties, CARMEN FreeFlow can be delivered with a proprietary video capture card which serves as a neural network controller too. After integrating Carmen Parking into parking management systems, controlled and automatic vehicle entry and exit in car parks or secure zones become possible. Furthermore, the ability to recognize registration number is a significant added value for comprehensive parking solutions or inventory management.